Russia and the Arab League proposed Wednesday to broker talks between the Syrian opposition and President Bashar Assad's regime to try to resolve the country's civil war, while a government airstrike on a rebellious Damascus suburb killed at least 20 people. The 23-month-old conflict in Syria, which has killed more than 70,000 people and laid waste to the country's cities, has repeatedly defied international efforts to bring the parties together to end the bloodshed. Wednesday's offer from Moscow, one of Assad's closest allies, suggested the regime could be warming to the idea of a settlement as it struggles to hold territory and claw back ground it has lost. Russian Foreign Minister Sergey Lavrov said the Kremlin and the Arab League are attempting to establish direct contact between the Syrian regime and the opposition. Sitting down at the negotiating table is the only way to end the conflict without irreparably damaging Syria, he said. "Neither side can allow itself to rely on a military solution to the conflict, because it's a road to nowhere, a road to mutual destruction of the people," Lavrov said in Moscow, where he hosted league officials and several Arab foreign ministers. 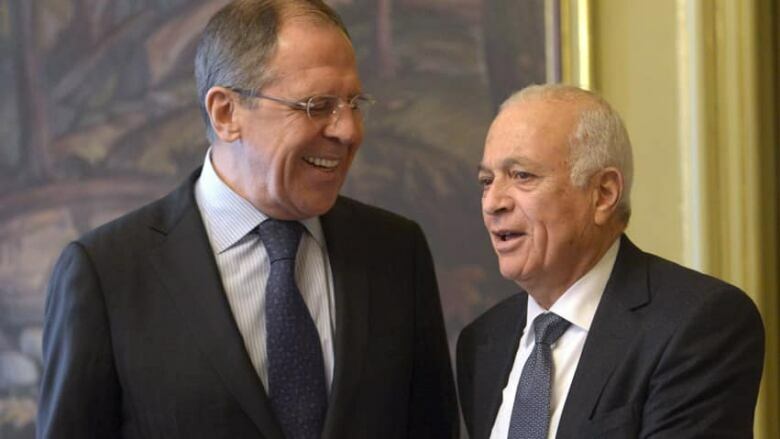 Both Lavrov and Arab League General Secretary Nabil Elaraby said their main priority was creating a transitional government in Syria to navigate a way out of the conflict. No conditions for the Syrian negotiations have been set. Lavrov said both sides' readiness to begin talks was "the most important thing." Syrian Foreign Minister Walid al-Moallem will lead a delegation to Moscow on Monday, and Russia is expecting a visit in March from the opposition Syrian National Coalition leader, Mouaz al-Khatib. Al-Khatib has said he is open to talks with the regime that could pave the way for Assad's departure, but that the Syrian leader must first release tens of thousands of detainees. The government has refused. Russia's proposal Wednesday got a cool reception from the opposition. "We cannot agree to that," said Abdelbaset Sieda, a senior member of the Syrian National Coalition. "Assad and his group must go first. After that we can discuss with others in the regime who didn't share in the killing of our people." Still, Wednesday's proposal was notable because it emanated from Russia — Assad's chief advocate on the international stage. It is unlikely that Moscow would publicly propose to host talks without having first secured Damascus' word that it would indeed sit down with the opposition. The timing also might mean the regime is showing a willingness to negotiate. Syria's rebels have notched a series of tactical victories in recent weeks, capturing the nation's largest hydroelectric dam and overtaking airbases in the northeast. They also have cut off a key highway in Damascus and are making forays to within a mile of the heart of the heavily guarded capital. The air raid Wednesday hit the Damascus suburb of Hamouriyeh, killing at least 20 people, according to the Britain-based Syrian Observatory for Human Rights. More people were believed to be buried under the debris. Another activist group, the Local Coordination Committees, put the death toll higher, saying up to 35 were killed and dozens more were wounded. Amateur videos posted online showed several vehicles on fire as thick black smoke billowed from a street. The videos show the bodies of two people, who were burned, in a pickup truck and the charred corpse of another person lying on the ground. The videos appeared genuine and corresponded to other reporting on the events by The Associated Press. Earlier Wednesday, two mortars crashed into a sports complex in the normally calm neighborhood of Baramkeh in central Damascus, killing one soccer player and wounding three more. The mortar attack was the second in as many days in Damascus. On Tuesday, two mortars exploded near one of Assad's palaces, but no one was hurt. The state news agency said the mortars that hit a complex housing Tishrin Stadium and a hotel killed Youssef Suleiman from al-Wathbah club based in Homs. He was wounded inside the hotel as players were getting ready for practice and died later at a hospital. Suleiman, a striker, had played internationally on one of Syria's national youth teams. His teammates said he was the father of a 6-month-old baby. State TV broadcast video of what it said was the hotel. The explosion blew out the windows on the first floor of the building, and shattered glass covered three beds in one of the rooms in which a bloodied duffle bag lay on the floor. "We were collecting our things about to head to the stadium when we heard the first explosion and the windows were blown off," said Ali Ghosn, a 20-year-old al-Wathbah player. "Youssef was hit in the neck. We ran out to the corridor when the second explosion struck and I saw Youssef fall down bleeding from his neck," he told the AP in Damascus as some of his colleagues wept. The attack occurred a few hours before the team was to play the Hama-based al-Mawaair club in Syria's domestic league, which has been delayed several times because of the violence. The game was postponed after the mortar strike. The nine-team league got under way just last week with all matches scheduled to be played in the heavily guarded capital in front of empty stands. Assad has tried to maintain an image as the head of a functioning state even as rebels edge closer to his seat of power and targeted attacks suggest rebels may be trying to shatter the sense of normalcy he has tried to portray in the capital. Also Wednesday, Syrian rebel army chief Gen. Salim Idriss told Al-Arabiya TV that if the Lebanese Shiite militant group Hezbollah does not end its involvement in Syrian towns near the border, "the Free Syrian Army will pound Hezbollah's positions with all the weapons it has." Syrian activists have said that Hezbollah fighters clashed with rebels in Sunni and Shia villages just inside Syria over the weekend. A local Lebanese official in Hermel, near the border, said Hezbollah fighters had entered Syria to protect the Shia villages. Two of them were killed, he said, speaking on condition of anonymity because he was not authorized to discuss Hezbollah matters.